The Addams Family, He'll Get the Point Now! #26 He'll Get the Point Now! 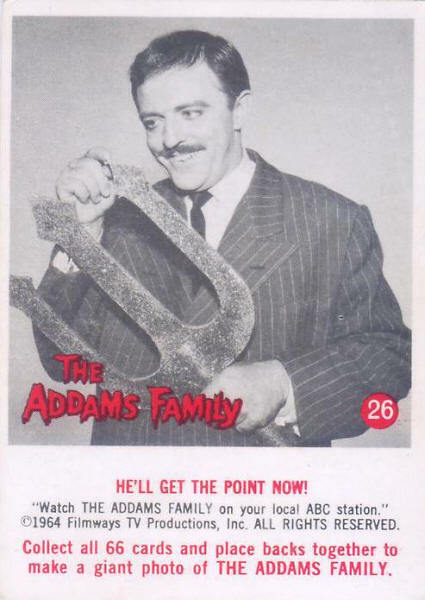 "Watch THE ADDAMS FAMILY on your local ABC station"
c 2 Somebody Drank My Embalming Fluid! c 35 I Always Play in Poison Ivy! c 3 Feeding the Tropical Fish! c 36 "Thing"
c 7 I'm Your New Neighbor! c 40 It Only Hurts When I Cough! c 10 This Will Stop His Headache! c 43 Bury the Next One over There! c 11 My Brother-in-Law! c 44 "Morticia"
c 12 Only 3 More and the Cemetery Is Full c 45 Yea, Yea, Yea! c 14 Want Some Lizard Soup? c 47 He Saw Lurch! c 15 Your Slab Will Be Ready in a Moment c 48 Look, No Dandruff! c 17 Got Any Ghostly Numbers? c 50 You're a Real Cut-Up Fester! c 19 "Fester" c 52 Whaddya Mean, I Need a Man's Deodorant? c 20 Don't Move, You'll Spoil My Shot! c 53 Son, Now Don't Scalp Fester! c 23 I Can't Stand a Lumpy Mattress! c 56 I Won't Be Home for Dinner! c 24 I Always Use Live Bait! c 57 Lurch Lowers the Body so Beautifully! c 25 My Own Graveyard! c 58 Let's Eat Before He Wakes Up! c 27 Your Kids Ate My Spiders c 60 What Do You Mean, Follow You? c 29 Yes, the Real Estate Is Getting Cheaper c 62 Hang Around and I'll Call the Butler! c 33 What'll I Wear for Halloween? c 66 Quit Shaking the Coffin!